On Saturday, several hundred people gathered in Hoxton Square. They wore rainbow colours, sequins, and national dress. They carried drums and trumpets, banners and a huge red heart. 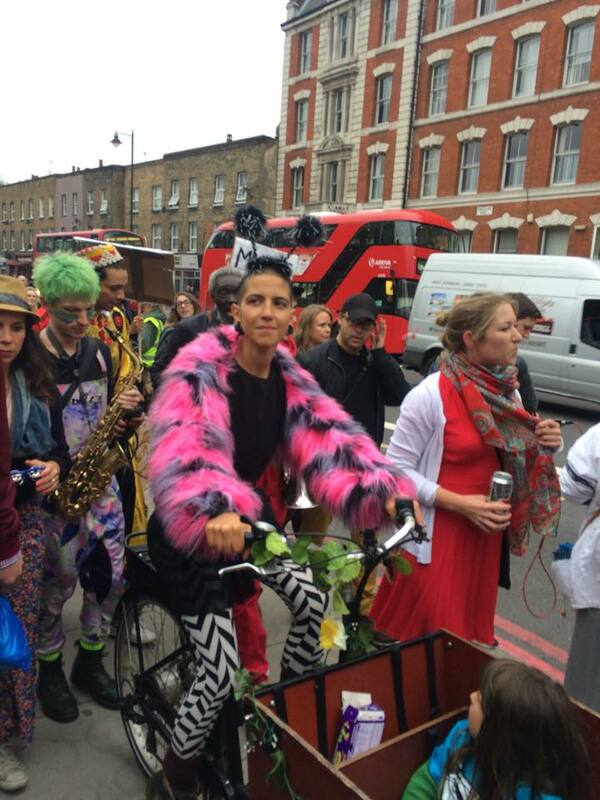 At 5pm they set off up Kingsland Road, dancing as they went, with passing buses and cars hooting encouragement. 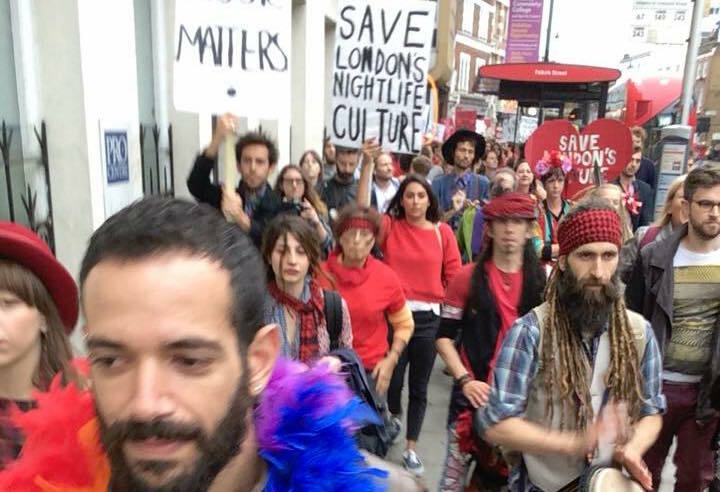 The march was in protest at the sudden closure of a much-loved Dalston music and community venue: Passing Clouds. The venue, which was in its 10th year, had a respected reputation in East London and beyond for its eclectic programme of music from roots and world sounds to urban grooves, as well as film nights, talks, yoga, and dance classes. In August the building’s new owners evicted the venue’s staff, boarded up the windows and repainted the frontage grey in preparation for redevelopment into offices. But as Saturday’s triumphant procession showed, Passing Clouds is not going down without a fight. The battle has been going on since September last year, when Passing Clouds received the news that the building the venue had occupied for ten years had been sold to Landhold Developments Ltd. Landhold, a south-East based developers, specialises in brownfield site acquisition in, to date, 28 of the 32 London boroughs. After acquiring the Richmond Road site in September 2015, Landhold initially indicated that Passing Clouds would be able to stay. However, after a frustrating year of uncertainty during which Passing Clouds repeatedly tried to open negotiations with their new landlords, the building was seized by baliffs on 16 August, and the venue staff evicted. The case has attracted much media interest—particularly after footage of Passing Clouds supporters breaking back into the building after an earlier eviction attempt went viral—highlighting the wider issues of redevelopment and gentrification and the dire threat now posed to music venues. Between 2007 and 2015, 35% of London’s grassroots music venues closed, representing a devastating blow to the foundation of the music industry in Britain, thought to be worth around £3.5billion a year. Nearby club Dance Tunnel closed in August, blaming Hackney’s ‘licensing climate’. Cable fell victim to the expansion of London Bridge Station in 2013, while longer ago the redevelopment of the area north of King’s Cross saw a slew of club closures and the destruction of a whole community around York Way in 2007 and 2008. In Soho, the Crossrail development has so far seen off the Astoria, Metro, Madame JoJos, the 12 Bar Club, and Enterprise Studios, with more venues threatened. Weeks after Passing Clouds were evicted, Farringdon’s Fabric was also closed. But a backlash is under way. The Music Venues Trust (MVT) is a rallying point for those with an interest in preserving London’s thriving music scene. In October 2015, its CEO, Mark Davyd, produced a report on the value of and threat to the London music venues. Without grassroots venues, the report argues, it is impossible for new talent to be discovered, fostered, and developed, and thus for a next generation of artists to be created. For Mark Davyd, it is London boroughs that must take the initiative for real change to take place. One of the recommendations Davyd and his committee made in their report for the Mayor was that Boroughs consider taking out Article 4 Directions on their music venues. These can be applied borough-wide or to specific areas, and act to ensure that any Change of Use application for a building requires planning permission, making it much harder for developers to buy up venues, evict the tenants, and turn the buildings into flats. As Davyd tells me, this approach has already seen some success: “The week that Passing Clouds were evicted was the same week that Wandsworth Council applied an Article 4 across the borough. London Mayor Sadiq Khan has been vocal in his campaigning for the protection of venues, calling them “the lifeblood of the capital’s diverse cultural scene” and working with boroughs and developers to find solutions to disputes like Passing Clouds. A Night Czar, with the specific remit of brokering diplomatic deals between venues and the rest of the community, will shortly be appointed. But all this may have come too late for Passing Clouds. However heartfelt Saturday’s demonstration, the campaign can only run to catch up as the developers impose their upper hand. But if the march was a show of defiance and of anger, it was also an expression of great joy, and not just for those taking part. People along the route came out of shops and restaurants, leaned out of upstairs windows and took photos from buses. One man even came out onto his shop roof on Kingland Road and danced as though his life depended on it. The pleasure on people’s faces as they heard live music was undeniable. What better expression of what is at stake, what London could so easily lose forever?